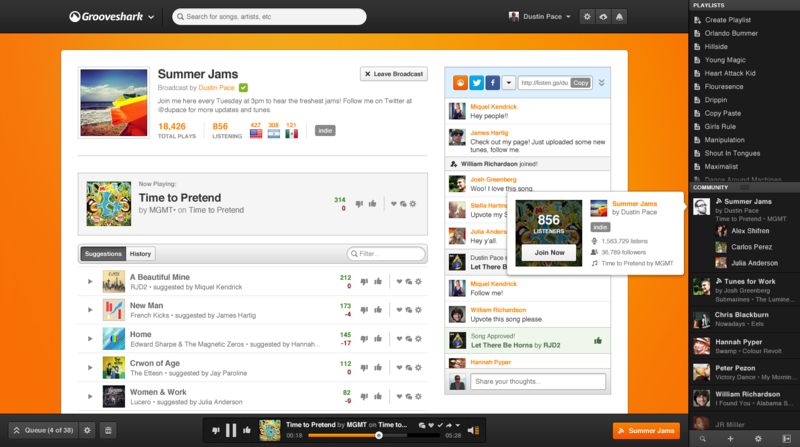 Grooveshark is one of the largest on-demand music services on the Internet. Created in the United States, it has 20 million users. Unlike Deezer and Spotify, the Grooveshark’s catalog is made up of user-uploaded songs. So, it’s a powerful tool allowing to upload and share music and offering over 15 million songs. More than a platform music, Grooveshark is like a « small label » because it helps all artists and labels to upload their content on it and users can discover new songs and explore new genres. You don’t need an account to listen to music with Grooveshark. You can easily find songs according to different categories : by song, artist, album or users’playlist… Grooveshark gives also access many genre Radio Stations and make recommendations too. However, if you want to build playlists, share them with friends, add songs to your collection, it’s necessary to sign up for a free account. Thanks to the « Community » section, you can « follow » your friends and view their activity on the website. The listening time is unlimited, you can listen to as much music as you want but it’s possible to suscribe to a Premium account letting you remove ads and listen on your smartphone.